The rolling hills of Kentucky are covered with rich fields of grass and a collection of herbs and wildflowers. The bright yellow flowers of the common herb, goldenrod, are common against the green backdrop, and these cheerful blooms have been designated the state’s flower since 1926. Before goldenrod was selected as the state flower, the blue grass of Kentucky and then the trumpet vine has the distinction of the state flower of Kentucky. In 1921 however, the Kentucky Federation of Women’s Clubs began to promote goldenrod as the best choice for the state flower. The flower has already been made a part of the state flag although the military argued the trumpet vine was associated with the state militia. The people of Kentucky threw their support behind the goldenrod that grew in all parts of the state and in March of 1926, goldenrod was officially selected as the state flower of Kentucky. Kentucky is not alone in selecting goldenrod as a state flower. Nebraska and South Carolina have the distinction as well. 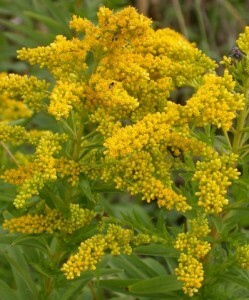 This is not surprising as goldenrod is one of the most prolific wildflowers in America. 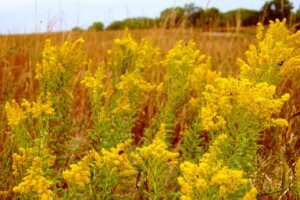 Goldenrod has not sat easily in its position as the state flower of Kentucky, however. As a common wildflower, it’s been argued many times that the plant is a weed and not worthy of the state flower distinction. Twice a vote has passed one house of the state legislature but failed in the other to change the state flower. Goldenrod is a natural wildflower that grows throughout the United States. The tiny yellow flowers grow in bunches along a tall stem. Goldenrod forms a bushy shrub along the roadsides of Kentucky in the fall and is present in fields and some gardens as well. Goldenrod can become invasive, so be sure to plant a smaller variety in your garden. Goldenrod requires moderate fertilization and well-drained soil. The goldenrod grows best in full sun with little or no shade. Plant goldenrod plants about a foot apart and not very deep in fertilized soil. The bright yellow flowers of goldenrod come to bloom in the late summer and fall giving any garden brilliant color. 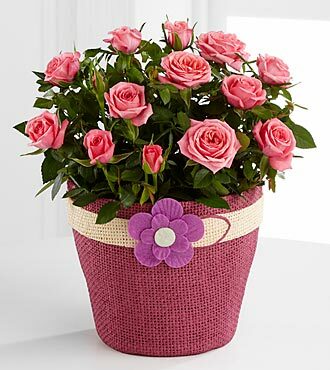 This entry was posted on Sunday, May 15th, 2011 at 12:30 pm	and is filed under American Flowers. You can follow any responses to this entry through the RSS 2.0 feed. Why do you say the goldenrod is present in the Fall. It’s only April and already fields are full of it.